How a typical small business website can benefit from clear, persuasive copywriting and SEO research. 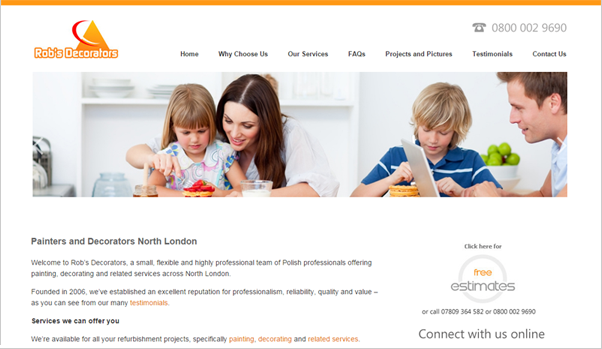 Rob’s Decorators is based in North West London and was founded in 2008. Polish tradesmen have established an excellent reputation for value and efficiency, and Rob Kublicki is no exception. However, there is massive competition on the internet for decorators, as well as for other services offered by the company such as carpentry and painting. Initial keyword research revealed a wide variety of terms which people searched for. Typically, they would combine a service or professional (for example ‘decorators’, ‘decorating’, ‘home decorators’, ‘painters and decorators’) with a geographical term (for example, ‘London’, ‘North West London’, ‘Kilburn’ or ‘NW6’). But which were the ones to go for? ‘Decorators London’, while popular, would be extremely hard to get near the top of Google. On the other hand, ”Home painters and decorators in Central Kilburn’ would probably be easy to get to the top with – but almost no-one would ever search for that term. By looking at search levels and cross-referencing with Google searches and checking out competitors, I was able to choose terms which were both relatively popular and which stood a good chance of ending up on the first page of Google when searched for. I additionally recommended expanding their current website. It’s tempting to just have a small website, typically putting all your products or services on just one page. However, having a separate page for each service allows you to optimise more terms. It’s also good for potential customers, who are generally looking for something specific and are reassured that you clearly know about it, rather than it just being a line or two in a list. I also added two pages to their site: ‘Why choose us?’ and ‘Testimonials’. When potential customers find a site through a search, they’re not just looking for a product or service, they’re after reassurance. Until they clicked on a result, they’d probably never heard of you. Being able to see what sets you apart from the competition on a single page, together with what other people think of you can make a real difference in persuading them to contact you. All this made for a bigger site than they originally envisaged, but it also made for a far more successful site. Visitors typically only looked at a few pages, but they were able first to find the site, and second to find the service and reassurance they needed to persuade them to get in touch. Vojtec Gutak, MD, Rob’s Decorators. Follow the link to see more examples of website copywriting for small businesses.